It was interesting reading about how this book came about. Walter Moskalew, Sviatoslav Richter’s younger cousin, is the guardian of the Richter family archive – a valuable collection of letters, papers, photographs and artworks. Anthony Phillips, who edited and translated this volume, first met the pianist in 1961 on his first concert tour to London. Richter asked Phillips to act as companion on his next tour to the States in 1965 "to shield him from the more uncongenial aspects of the New World". It was on this tour that Phillips met members of the Richter family, including Meri, his aunt and Walter Moskalew, his cousin. Moskalew and Phillips kept in touch, and this book is the result of a ten year collaboration between them. An artist of stunning virtuosity and formidable musicianship, Richter can perhaps claim the largest and most comprehensive discography of any pianist. It extends from 1947-1994, more than 80% live, and is impressive on all counts for its sheer range. What comes as a surprise to many is that he was largely self-taught, and did not begin formal lessons until he was 22 when he entered the Moscow Conservatory as a pupil of Heinrich Neuhaus, who also taught Emil Gilels. The book offers insights into the childhood and formative years of Svetik, ‘Little Light’ as he was known to his family, and offers some answers as to the circumstances that turned this unique and enigmatic character into one of the greatest pianists of the twentieth century. He was born near Zhitomir in present-day Ukraine. In 1918 his parents were in Odessa, Anna ‘Nyuta’ had travelled there to care for Theo who had typhus; then the Civil War broke out and they became separated from their son. Svetik moved in with his aunt Tamara ‘Meri’ and she brought him up almost as her own son from 1918 to 1921. In 1921 the family were reunited, and the Richters moved to Odessa where Theo landed a job at the music Conservatory there. By the beginning of World War II, Richter's mother had fallen in love with another man called Sergei. As Theo was a German, he was under suspicion as a collaborator and a plan was hatched for the family to flee the country. Nyuta procrastinated due to her involvement with Sergei, and remained in Odessa. In August 1941 Theo was arrested, found guilty of espionage and executed on 6 October 1941. A bizarre picture is painted in the book of Nyuta’s second husband Sergei. He was the son of one of the Tsar’s high-ranking officials. He taught music theory and composition at the Conservatory in Odessa, which is where the two probably met. His German extraction was a source of much worry to him, and he spent a period bedridden, having faked illness. There’s a photograph showing him in bed, overlooked by a portrait of Lenin; the two look remarkably similar. What attracted Nyuta to this man, who lived in squalor, surrounded by birdcages, the occupants depositing their droppings all over the apartment, remains a mystery. His odd behaviour found him lurking behind bushes to trap birds. He smoked cigarette butts picked up in the street, completely disregarding the fact that Nyuta was asthmatic. Richter’s relationship with his stepfather is discussed at length. In short, he grew to dislike Sergei intensely; his incessant prattle was a constant irritation. On a visit to Schwäbisch Gmünd in 1961, not having met Nyuta for several years, Svetik found that "she had completely changed" and Sergei had "cast a spell on her with his inane chatter, never leaving her alone for a moment, never letting her get a word in edgeways". There can be little doubt that Sergei drove a wedge between mother and son. A picture emerges of two strong-willed women in Svetik’s life: Meri and Nyuta. One senses a personality clash between the two, yet there was an underlying deep sibling closeness, instanced by their extensive correspondence. After a long period of separation, mother and son finally met in 1960 when Nyuta wrote him a letter. The family, including Nyuta, Sergei and Meri joined Richter in New York for his Carnegie Hall debut, and later travelled to Boston with him. It was on this tour that the family first met Nina, Richter’s wife. A year later in 1961, Richter again met with his mother at Bayreuth. Although the Richter family were relatively poor, they were intelligent, talented and cultured. His father Theo was a pianist, and his mother Theo’s one-time student. His grandfather Pavel was an accomplished painter, and his aunt Meri a gifted artist, story-teller and poet. She would tell little Svetik stories, and this inspired her to write a book titled Hanspeter Waldtraum (Hanspeter’s Forest Dream), which actually saw publication in 1927. It was Meri who exercised a powerful influence on the boy, stimulating his imagination with the fantasy world she related to him in her tales. This in turn may explain the sense of fantasy and imagination – a compelling feature of his musical interpretations. The intimate closeness between Richter and his aunt is discussed at length, as is their extensive correspondence over a twenty year period. Richter remained all his life a man of culture, well-read and a collector of art. The book relates how he studied art himself, producing works in a colourful Impressionistic style. He championed many Russian artists and put on exhibitions of their work in his own apartment, one such being Dmitri Krasnopevtsev. He was also particularly fond of the work of Robert Falk. The book skirts around the question of Richter’s sexuality, and his marriage to Nina Dorliak was unconventional by any standards. Did they actually marry? Frau Hock, a close friend of Meri and Nyuta is quoted: "They make an unusual couple. They each have reserved as much freedom for themselves as their personalities demand ... Side by side on the same floor they have separate apartments, decorated with their own tastes." The Memoirs of Anna Moskalewa-Richter ‘Nyuta’, which form Part II, I found of particular interest in giving a social commentary on life in Russia prior to the Revolution. She recounts details of her engagement marriage ceremony, including photographs. There is some fascinating information on medical treatments practised at the time. When Svetik was diagnosed with food poisoning for instance, a paediatrician prescribed camomile tea and camomile baths. Part III is entitled "Sviatoslav Richter as a Young Boy". Written by his Aunt Meri, it recounts her sister Yelena’s death from typhoid in 1918 at the age of only twenty-two. 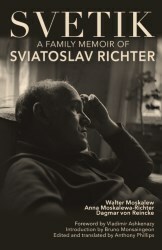 This is a handsomely produced book, offering many insights into the enigmatic character of Sviatoslav Richter. It is studded with interesting photographs, providing a visual feast. Anthony Phillips has done a sterling job translating this material, and the book reads well. There’s a useful genealogy of the Moskalew family at the beginning and a convenient glossary of names and places at the end. Page-by-page footnotes and a comprehensive index are helpful. Richter aficionados, like myself, will find it a fascinating account from start to finish.